Since when did Pumpkins in the Park welcome so many costumed runners? 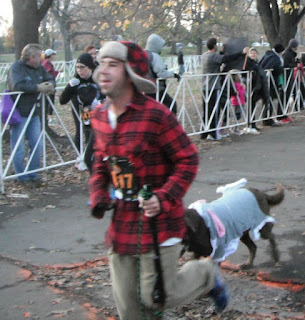 Since the 5K became the Chicago race to run for Halloween, which was this year. 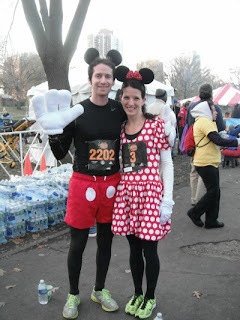 I seriously think I could stare at costumed runners all day--I'm still thawing out from this early evening event, a result of wearing too little clothing on too cold of a day and staying outside for too long with too few layers. These runners are far more daring--especially those who wear costumes that don't look conducive to running--and more creative than I. If you weren't wearing a costume, face paint or some Halloween colors, you were in the minority. Who'd think to cross dress like the couple above? Or wear a cloak that looked like it belonged to a Japanese emperor (I don't have pictures of that one but I literally followed that costumed runner the entire race)? Or how about the the hunter and his sheep (at least I think that's what he was supposed to be), above at right? 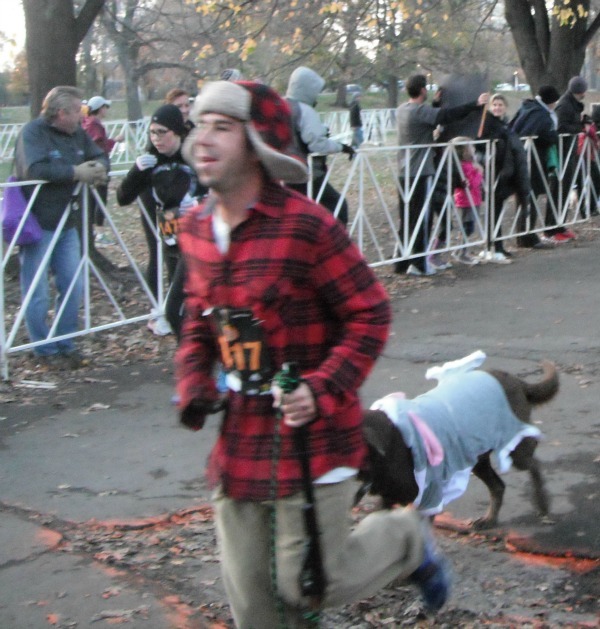 So much for my excuse that you can't run fast in a costume. Minnie Mouse proved me wrong--she, Melissa Hardesty, was the second fastest female of the day. 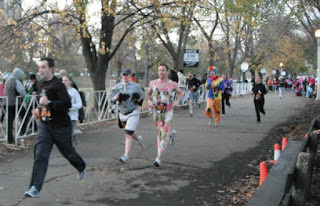 And if memory serves me correct, the female winner, Pam Staton, also ran clad in costume. Guess I should have whipped out the ladybug wings...maybe I would have flown across the finish line a little faster.